For the past few months I have done a “Sunday Special” post, once a month, in honor of the Sunday newspapers. Those posts, for the most part, had links to other blogger sites with some vintage tidbits here and there. This month, Sunday Special kicks off a series of Vintage Christmas posts…( if any of you who might read this have a similar post or memories post, please link it up in ‘comments’ for all of us that like this sort of stuff to enjoy :) This is the first of three. For any of us that live with four seasons, this idyllic scene represents some of our fondest Christmas memories. Years from now, people will look back fondly with nostalgia at trees that had burlap on them. Just as people do now in regards to tinsel. This is from the chapter “Old-Fashioned Christmas in Michigan” by Julee Rosso. “Then it was back to my grandparents’ house for Christmas Eve dinner….We gathered in the huge cabbage-rose living room that had twenty-foot trees in each of its corners. This was my grandmother’s favorite treat for all of us. 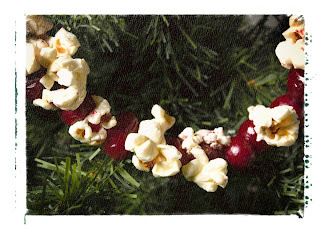 In one corner her Harvest Tree was covered with fruit, tartan ribbons, tiny baskets, straw figures, miniature gourds, nuts, and strings of cranberry and popcorn. In another corner the Spice Tree had gingerbread men, pomanders, nosegays of rosemary, nutmeg, and cinnamon sticks, and candy canes. The Peace Tree was a vision of white with wild juniper, white doves, dried sea lavender, angels, baby’s breath, and a dusting of snow. Then does anyone remember what I called the tinsel tree. My grandparents had a traditional tree in their living room but a tree similar to this one stood on a corner table in the dining room and all of their Christmas cards were hung there. My sister has that old tree now :) She puts it up in a little corner on a table in her family room, as it holds sweet memories of Christmas time at our grandparents when we were young.